By now I know exactly what to expect when I open a James Patterson novel. His heroes will be classic good guys with just enough personal baggage to keep us invested in them. His villains will be psychopaths hellbent on taking down the hero. The story will unfold through short chapters that usually end in mini cliff-hangers. All combined, these elements keep the pages turning quickly and provide a mild diversion from everyday life. It is a tried and true formula that has turned Patterson into one of the bestselling authors of all time. Even when I complain about his use of co-authors to churn out multiple books a year and the deficit in quality this has caused, I can't help but come back for more. And so I started Burn, the seventh installment in the Michael Bennett series knowing pretty much what I was in store for. Michael Bennett and his brood of adopted children finally return home to New York after being hidden in witness protection for most of the last novel. Despite having nabbed one of the most notorious drug lords in the world, Bennett is not given the hero's welcome he expected. Instead, the NYPD has assigned him to lead a community outreach squad in Harlem. The poorly supported squad lacks the resources and personnel to adequately assist the large population that it has been charged with. The bureaucratic systems that people have to follow to provide tips to the squad means that potentially valuable information goes unnoticed by the people who are supposed to act on it. When a burned body is found at a property of a previously ignored tip, Bennett vows to correct the broken system and bring justice to the people he has been tasked with serving. Just as Michael is starting to implement changes at the squad, he gets pulled into another high profile case. This time a string of jewelry heists have left the department stumped. When the higher ups beg Bennett to step in, he only agrees to assist if he can continue his duties with the outreach squad as well. Soon he finds himself back in the crazy juggling act that his turns into all too often. The stresses of work coupled with a budding romance with his live in nanny and the duties of being a single father begin to take their toll on him. But Michael is determined to give his best in all aspects of his life. He is the hero after all. As I expected, Patterson delivered on all of the usual fronts. 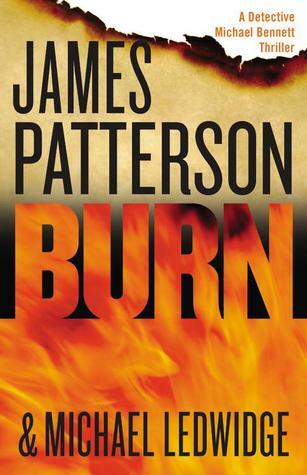 The Michael Bennett series is probably my second favorite Patterson saga behind the Alex Cross books, and Burn is certainly a worthy continuation of the story. More so than usual, I found the real joy of this novel was in reading about Michael's personal relationships with his family. That drama seemed to outweigh the more surface level crime threads in the book. In fact, with so much time devoted to developing a romance and maintaining the unique Bennett clan, the actual mystery was too brief. As I got to the last couple of pages, I would have even preferred a cliff-hanger that the rushed ending that we got. Still, Burn does nothing to deter me from looking forward to the next installment. The next time I'm looking for a quick and fun read, I'll definitely turn to a Patterson novel again. This entry was posted on Tuesday, July 5, 2016 and is filed under Burn,James Patterson,Michael Bennett,Mystery,Thriller. You can follow any responses to this entry through the RSS 2.0. You can leave a response.